Raised edge prevents spills from ending up on the floor. Suitable for children from 6 months onwards (need to be able to seat on his own). Pretty basic, this Ikea baby chair rental will allow to enjoy meal time even when staying outside home, by friends, grandparents or hotel. 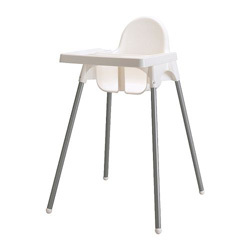 Your little one will be able to have his meals securely. For a young baby, we however recommands our Chicco Polly 2in1 highchair rental : this model features reclining backrest, adjustable height and a 5-point security harness, that will make a better baby's confort and security. And for a toddler aged 18months and more, why not a booster seat rental that can be adjusted on almost any regular chair. Rebecca (high chair rental in Paris): "This was a great service! We were staying in Paris with our 10 month old for 2 weeks and rented a high chair. I don't know what we would have done without it! They dropped it off and picked it up right on time, it was in great condition and was very clean. We brought our pack n play but I would also rent a crib if I were to visit again."